As long term readers of Gidday from the UK will know, about 16 months ago I crossed to ‘the dark side’ and got a Kindle. Audrey quickly became an integral part of my daily commute and bedtime ritual and it wasn’t long before I wondered what I had ever done without her. In short, I fell in love. But even the best and most faithful of companions needs a little TLC so I am pleased to report that my stalwart commuting friend has a gorgeous new red frock. Audrey’s new duds – given it was a Christmas gift from Mum, it seems rather appropriate that ‘melbourne’ appears front and centre. This amazing cover is actually designed by artist Sharyn Sowell, a relentless traveller and blogger who is fascinated by the juxtaposition of the very old and the very new. …mine and Audrey’s that is. 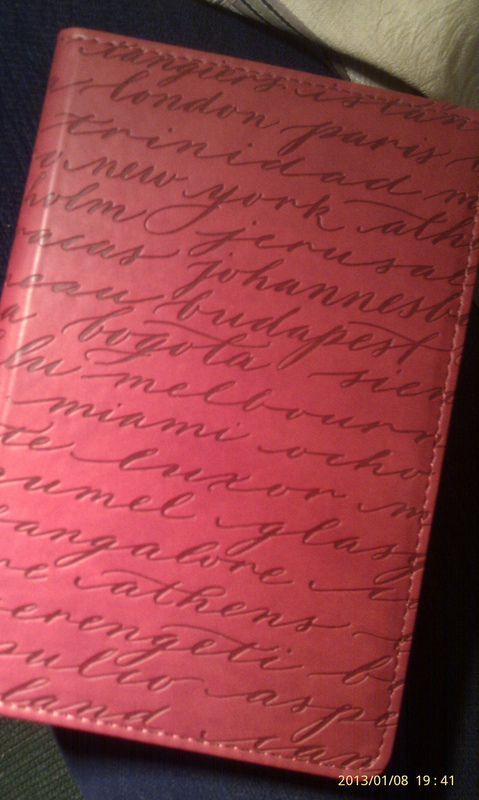 This entry was posted in All About Me, Expat moments, Inspired by, Melbourne and tagged Audrey, Kindle, Melbourne by Kym Hamer. Bookmark the permalink. Thanks Cathy and welcome to kindle-dom. I don't leave home without mine and I'm not sure whether it pragmatism or addiction! It is a gorgeous cover Kym, no wonder you are happy with it. I got a Kindle for Xmas from my husband and I am enjoying reading in a different way. He gets disappointed when he finds I haven't got it in my handbag! I hear you Linda. Trying to buy a new cover was ridiculous, partic. in Oz where Amazon doesn't exist to the same degree and every cover on sale was for the smaller Kindle Fires etc. So I was even more delighted to find this fab one.